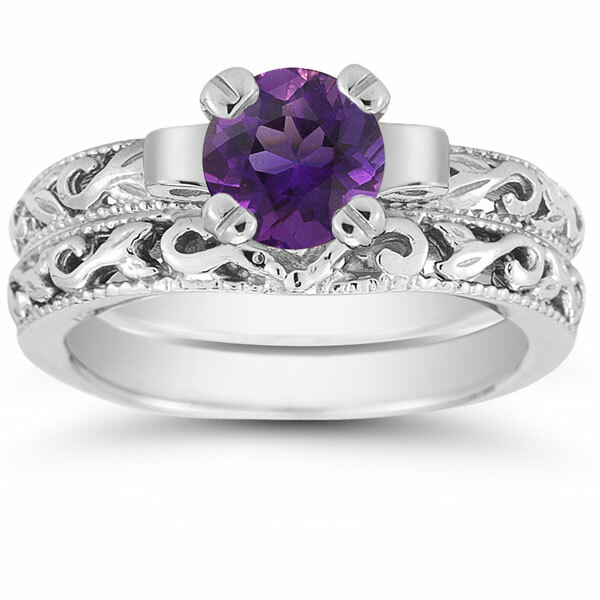 Amethyst makes this bridal ring set pop with the perfect splash of purple color. The 6mm gemstone features rich, violet hues that also help this ring set standout among standard wedding bands. The amethyst is round cut for perfect brilliance and is set in gleaming sterling silver. The two bands, also of sterling silver, are given a fashionable twist that features art deco style. With milgrain edging and expert craftsmanship, this sterling silver bridal set is an instant hit. We guarantee our Amethyst 1 Carat Art Deco Bridal Set in Sterling Silver to be high quality, authentic jewelry, as described above.